At least 2,018 terrorists have been "neutralized" in northwestern Syria's Afrin since Operation Olive Branch was launched on Jan. 20, Turkish Armed Forces announced Sunday, with eight more villages brought under control. A Turkish soldier has fallen Saturday during operations targeting YPG/PKK and Daesh terrorists, a Turkish Armed Forces statement said Sunday, without giving further information. So far, 33 Turkish soldiers have been killed in action during the operation. On Sunday, Turkish forces and Free Syrian Army (FSA) liberated eight more villages from YPG/PKK terrorists Saturday as part of the Operation Olive Branch in Afrin. The villages of Sarmalik, Shaykh Muhammadli, Wilakli, Dudu, Kavanda, Maydan Akbis and Bandirak, located northwest of Afrin town center, and the village Umranli and a nearby YPG/PKK training base, located northeast, have been cleared of the terrorists. A violent clash took place between the FSA forces and YPG/PKK terrorists near the training base located close to the town of Sharan. After neutralizing the terrorists, the FSA troops captured and entered the area which was used by the terrorists as an armed training camp. The terrorists had shaped the upper part of a rock found at the camp as a human head, depicting the terror group's leader. They had also written "APO" on the rock, referring to the convicted head of the terrorist PKK. The FSA forces destroyed the rock after they captured the camp. They also found scores of pennants and documents of the terror group. Since the launch of the operation, Turkish military and the FSA liberated 112 locations including one of Afrin's five towns, 83 villages, six smaller villages 20 strategic mountains and hills and two YPG/PKK bases. 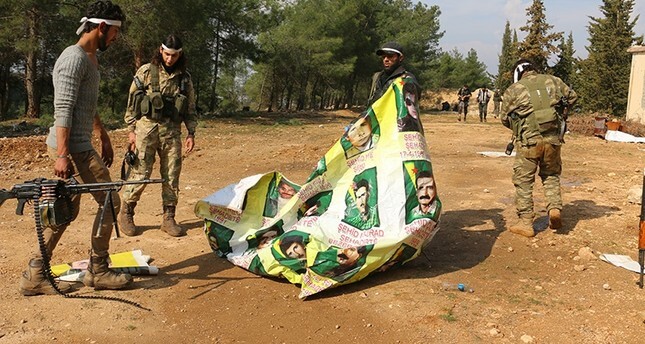 The TSK along with the FSA launched Operation Olive Branch in Afrin targeting the PKK terror group's Syrian affiliates the Democratic Union Party (PYD) and its armed wing the People's Protection Units (YPG) as well as remaining Daesh elements in the region. The military also said only terror targets are being destroyed and "utmost care" is being taken to avoid harming civilians.